I really enjoyed reading It Feels Good When I Stop, but the accompanying solo covers album was disappointing. 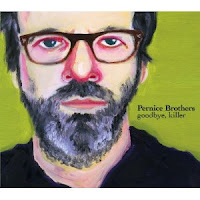 I am happy to report that was just tiny vurp and that the new Pernice Brothers' album returns to the carefully clever phrasing and imaginative descriptions that initially drew me in a couple albums back. For the most part, the songs are stripped down to little more than a gently strummed guitar and Pernice's voice, with some subtle accompaniment that give the songs a warm and full sound. I really like "Bachamel", and not just because it reminds me of delicious mac 'n cheese. It's catchy and darkly playful. The country-tinged "Newport News" and the quiet and beautiful "The End of Faith" savor the melancholy tone while "Jacquline Susann" adds a bit of spice with couple lines of electric guitar and a quickened beat.